Over Cosmetics, a brand of skin and body care therapeutic products, heel balms and scrubs. Foot ointment, recommended for the diabetic foot, bedsores, burn or hard-to-heal wounds. Moisturizing body balm, excellent for the damaged and weakened skin with a tendency towards injury. Soothing marigold balm, with rich extracts of marigold. 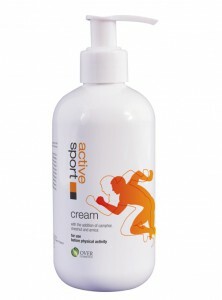 Activesport cream&gel for use before or after physical activity protecting muscles against strain or alleviating muscle tension. Body balm citrus, coffee&chocolate, cream, marigold&vanilla all with shea butter, nourish the skin intensely making it look healthy and radiant. Some of the finest products include the avocado hand cream, unbeatable for dry, rough or irritated skin. And heel balm with 3% or 10% urea for moisturizing or exfoliating effect.